The Armed Forces Memorial at the National Memorial Arboretum includes, within its sixteen thousand names, the names of those comrades of the members of the Shackleton Association who were lost during the course of Shackleton aircraft operations. This Register has been compiled in the order in which their names are engraved on the Memorial not only to help with the finding of a name but to also record for future generations their ranks, duties and brief circumstances of their loss. It is hoped that the establishment of the Armed Forces Memorial, the Shackleton Association Memorial and the Shackleton Association Register will preserve the memory of all who were lost, many of whom have no known grave but that of the ocean into which they fell. 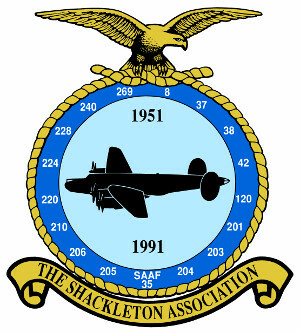 Presented to the Trustees of the National Memorial Arboretum by the Members of the Shackleton Association to commemorate the dedication of the Shackleton Association Memorial on June 4th 2008. VP261 of 240 Squadron, lost in the North Sea 25th June 1952. WL746 of 240 Squadron lost off the Argyllshire coast 11th December 1953. Wikipedia page on Shackleton accidents and incidents.